So, I had another distress inked galaxy background ready to use and could not resist to make a galaxy themed card. For the colours, I used some different purple pinks, blues, yellowish and of course black with some black and white paint for the spatter stars. So it is a nice dotted card for the Use Your Stuff Challenge. The sentiment and background fits the moon and stars challenge from Stempelkuche. 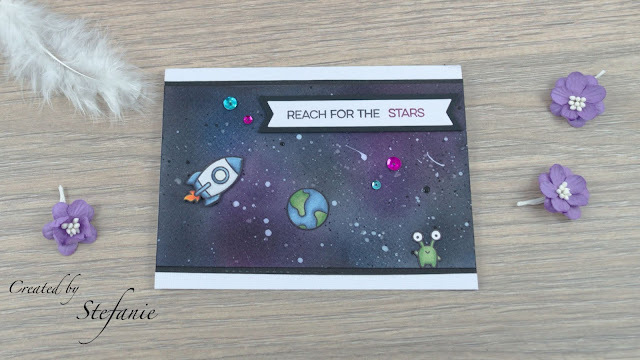 I layered everything on a black stroke of paper and added the cute images of the "Beam me Up" stamp set from Lawn Fawn. I coloured them with my Copics and added some glossy accents to the little window of the space ship. 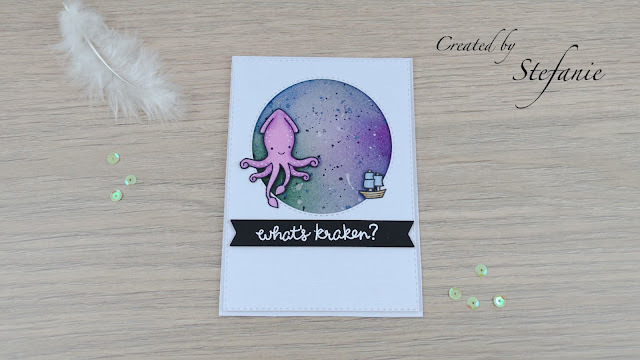 I also used the MFT stamp set "Written in the Stars" for the sentiment, which got some eye catcher in Berry Burst pink (SU). Some sequins in blue and pink finished this super easy card. Such a cute little card! Love your background and your layout. Thanks so much for playing along with us at Stempelküche challenge. sooo lovely!Thanks for joining us at STempelküche-challenge. Hi! I am Stefanie— craft enthusiastic. Join me as I share great stories, amazing projects and awesome tips for people who love to craft themselves!